As the Last Stand might be the end however people continually breathe life into the characters once again from the hilarious tendency to the film-production properties. This rigging has celebrated overall interest as an in-vogue pretense of the party capable snap and charms of this Peter Parker’s contrivance. Last Stand Spider-Man Jacket the general magnetism of this outerwear reflects the genuine portrayal and presence of the represented consideration grabber as the comparable clothing in the motion picture. You can make your gathering look eye-catching with this Spiderman The Last Stand Spider Logo Jacket accessible in both veritable and real calfskin material. Also, you will discover two pockets inside that are extensive to for your contraptions and cash. The outfit grasps maroon and dark shading while the uneven secured conclusion goes smooth like water. 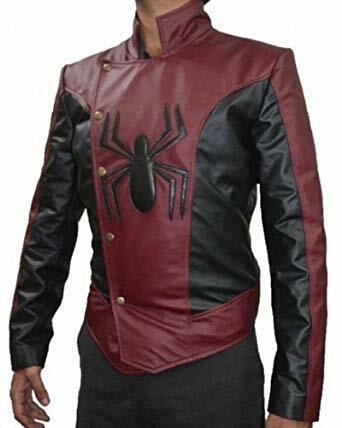 Last Stand Spider-Man Leather Jacket covers logo on the chest as a piece of its real embarkation while the sider is likewise embellished on back of the outerwear. It contributes stand neckline designs while finishes up with hemline on outskirts of reasonably settle the calfskin making.